The African Development Bank and FinDev Canada - the Canadian government's development finance institution - have agreed to collaborate in joint transaction opportunities, external partnerships and best practice to achieve the Sustainable Development Goals in Africa. 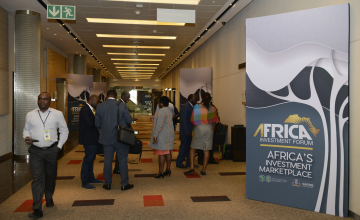 Leaders of the two institutions signed a memorandum of understanding Wednesday at the Africa Investment Forum, the continent's multi-stakeholder, multi-disciplinary collaborative platform for the economic and social development of the continent. Collaborative focus will be on climate action, job creation and women's economic empowerment. "Equality for women in Africa is fundamental to Africa's economic growth and to Africa's development. This is why we are very excited about this [partnership], " said Dr. Akinwumi A. Adesina, President of the African Development Bank. "Canada has done a great job of setting up a development finance institution to advance its development agenda. I couldn't be more delighted to be here with FinDev Canada to sign this. It is a great partnership and I look forward to our institutions working together, " he added. The agreement lays the groundwork for the Bank and FinDev Canada to explore a collaborative relationship in line with the African Development Bank's priority strategic areas, namely Feed Africa and Improved the Quality the of Life for the People of Africa. Just as importantly, the collaboration will see both institutions look at ways to work toward achievement of the Sustainable Development Goals (SDGs) in the region. FinDev Canada is answering the urgent call for partnerships to help achieve the Sustainable Development Goals by working with our peers in developing markets. The signature of this agreement marks the beginning of a promising collaboration towards Africa's sustainable industrialization through private sector investments with a development impact focus," said Suzanne Gaboury, Chief Investment Officer, FinDev Canada. At the signing ceremony, FinDev Canada and the African Development Bank said the two institutions aim to foster partnerships to help address the substantial financial gap between men and women in Africa's private sector. Other ceremony attendees included; Jennifer Blanke, the Bank's Vice President for Agriculture, Human and Social Development ; Omar Alghabra, Parliamentary Secretary to the Minister of International Trade Diversification, Canada ; Désiré Vencatachellum, Director, Resources Mobilization and Partnerships, as well as Sandra McCardell, High Commissioner in South Africa, Canada. President Adesina also credited David Stevenson, Executive Director at the African Development Bank representing Canada, China, Korea, Turkey and Kuwait. The African Development Bank and FinDev Canada share common values of providing solutions for Africa's private sector by creating opportunities in women's economic empowerment, climate action and job creation, as well as an interest in sectors such as financial institutions, agriculture and green growth. The African Development Bank Group is Africa's premier development finance institution. It comprises three distinct entities: the African Development Bank (AfDB), the African Development Fund (ADF) and the Nigeria Trust Fund (NTF). On the ground in 41 African countries with an external office in Japan, the African Development Bank contributes to the economic development and the social progress of its 54 regional member states.